Here are the top 5 reasons to consider choosing Greece if you are looking for motorcycle tours in Europe. 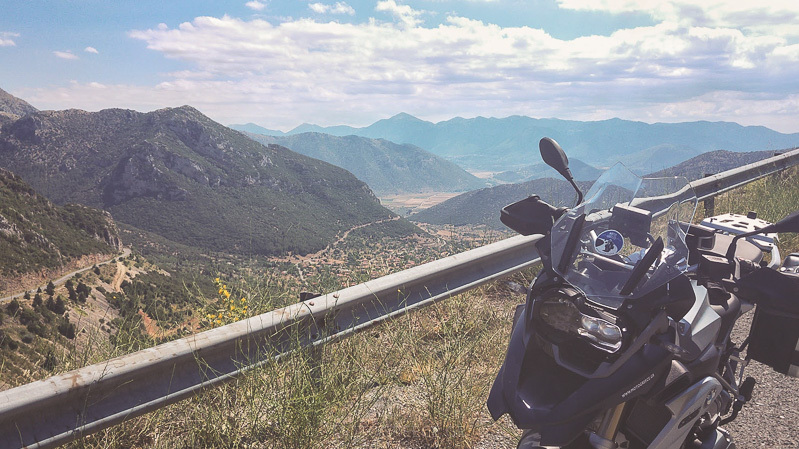 Motorcycle touring in Greece has been under the radar, slipping away from the attention of international riders. One of the possible explanations is that you haven’t had the right input about the roads and routes of the country. We have seen some rough ideas of other companies, from abroad, about their routes in Greece. It seems that they are missing a good portion of the best biking roads here. And then, when you search in forums for more, not much comes up. Ok, it’s time for you to revise! Seriously. A picture is worth a thousand words, so have a look at only a tiny sample of what we have to offer. Look at the header image of this post. Imagine continuing from the place where the photo was taken and following that road on the opposite hill, coming down to the valley and crossing until you get lost on the horizon. Or put yourself in the following scene. 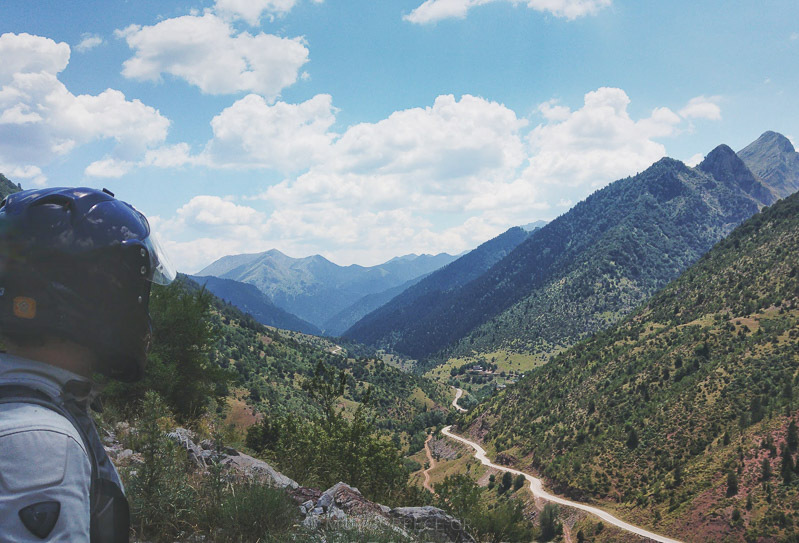 How much wow factor is there in this image, shot by our friend Byron on a road in Zagoria, in northwest Greece ? You might as well think it was shot in some exotic place. Well, this is in Greece! You see, there are so many similar routes in the country that we would need a large dedicated image gallery to showcase them. We have had clients who are experienced travelers and have been around places all over the world. This is important, because their comparisons are valid. 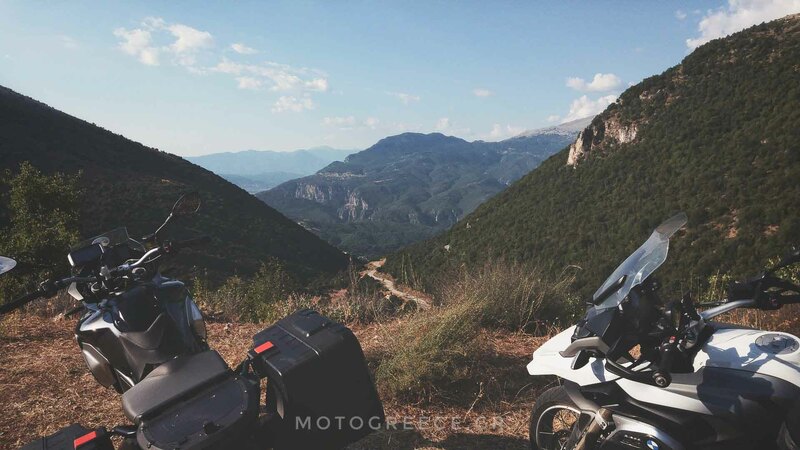 We showed them where to ride (or took them with us on our tours), and when the trip was finished, they all shared the same point of view: “Greece has a lot to offer to the motorcycling traveler, and not much to be jealous of, from other countries”. What about the following one? Shot by our friend George Hantzis during autumn in the Tzumerka mountainous region, also in northwest Greece. … Most of the riding time we were absolutely by ourselves on the road surrounded by amazing various views (from coastline to deep forests). Take a note of the last sentence. The routes that we show you offer everything a biker wants from a motorcycling tour in a new country: Amazing views, extraordinary diversity of the landscapes and minimal traffic ! Doesn’t the following image make you think that you should rather be out there riding? 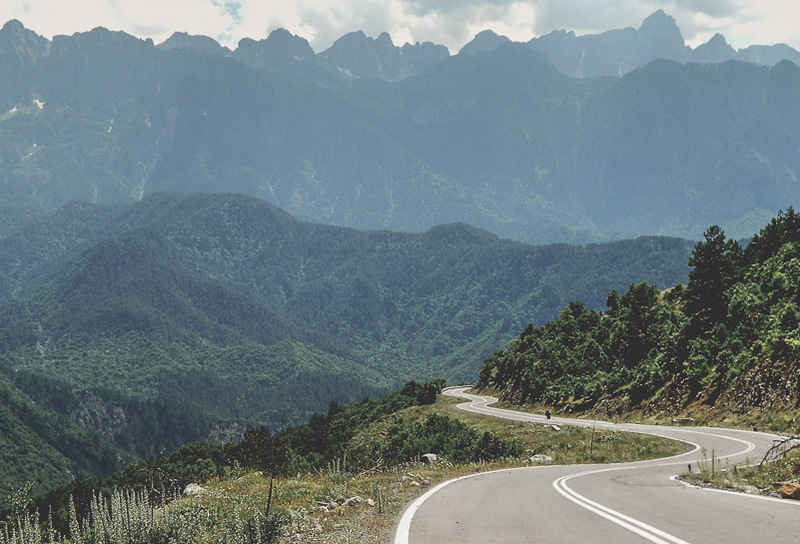 The roads shown in all of the above images, and numerous similar roads in the country have not been included in most of the touring packages offered by foreign operators. At least not to our knowledge. We rarely see them on posts of travel stories too, in forums or in Facebook or elsewhere. And if you try to plot a route, using popular navigation apps like Google Maps, most probably the result that you will get will ignore these roads. Let’s change this! All you have to do is come and ride with us! There is not much to be said here by us. The country that is called as the “craddle of western civilization”, with a timeline spanning more than 5 millennia, will fill all your check boxes. Numerous UNESCO world heritage sites. Places that you all have seen in Hollywood movies, stories and myths that are taught in schools the world all over, are all here. What is there left for us to talk about in a single blog post ? The culinary moments are always an important ingredient of any travel experience, and Greek cuisine can simply blow your mind ! From fresh seafood to exquisite game, from handmade dishes to rustic recipes, all are so tasty and tasteful that you are guaranteed to return home with a few pounds added on you. Greece enjoys a marvelous weather. The mild Mediterranean climate offers us more than 300 days of sunshine throughout the year. Spring and Autumn are simply ideal periods for motorcycle riding with temperatures within very comfortable ranges. Summer is also enjoyable, provided that you opt to ride mostly in mountainous areas where it will be cooler. And if you are in a mood for a swim, then it could only take an hour or so (or even less depending on region) to move yourself from a mountain resort to a simply amazing beach! We keep our fleet of motorcycles in top notch operating condition. We know how it feels when you arrive at your destination and you are given a bike that looks and feels old and worn out. That is not going to happen with MotoGreece. Our BMWs are serviced according to the manufacturer’s specs and only at authorized BMW dealer’s. Consumables (tires, brake pads etc) are never left to reach the end of their life, not even close. It is your safety, and safety is our top priority. There is no need to spend your evenings trying to search where all the good stuff is, because we can get you there. We can have everything organized for you. Choose from our fully guided tours or go self-guided, or even ask for an entirely customized trip. Our promise is that you will have a great time that most probably will make you want to return! 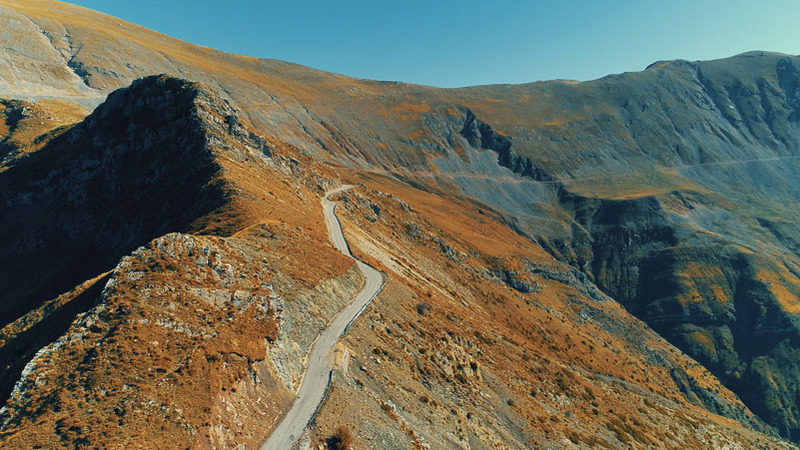 Other than motorcycling, for an extensive source of travel information we recommend you visit Greece-is.com [singleicon id=”fa-external-link” size=”1″]. It is an excellent web portal with tons of features and articles about destinations in Greece, experiences, and more. Office hours: Monday-Friday 9:30-17:00 or by appointment. Weekends : pick-ups and drop-offs only, by appointment.